My sisters, this is your cue, this is your moment in time. There is a world out there that desperately needs you, your gifts, your knowledge, your creativity, and your voice. 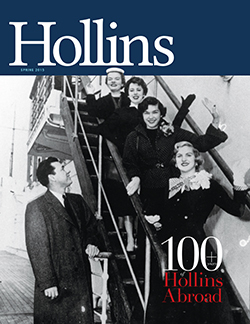 But be clear: You are about to enter a world where everything that you have learned here at Hollins will be tested. At every turn, you will be expected to prove yourself, because some still find it hard to believe that women are as capable as men. They want to know “what you’re working with,” and I need you to show them. Don’t leave them with any doubt in their minds about who you are. You found your voice and learned to speak up at Hollins, and you must continue to speak up and be heard, not just for your own survival and success, but for the benefit of all people, especially women, who deserve to live in a world that is equitable and just in every way. Hale is the founding and senior pastor of the 5,000-member Ray of Hope Christian Church in Decatur, Georgia, and considered one of America’s most dynamic pastors. 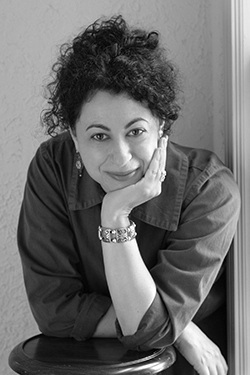 Elizabeth Poliner has always been a reader and a writer, but she took a circuitous path toward teaching college-level literature and creative writing. One of those diversions was getting a J.D. at the University of Virginia. The tutorials offered at the graduate level have special appeal to her because she can get to know the students over the course of a year. “I like how much depth we can achieve because of the continuity and the structure of the tutorial,” she says. 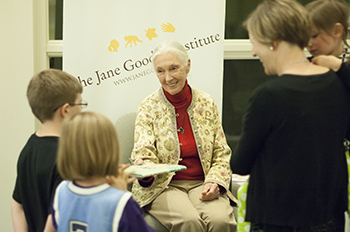 She may have turned 81 recently, but Jane Goodall still spends 300 days a year traveling the world on a mission to educate people of all ages about Earth’s environmental crises and the many threats to humans and animals alike. The noted primatologist and conservationist brought her message of hope to an audience that filled both the Hollins Theatre and duPont Chapel, where her address was simulcast. 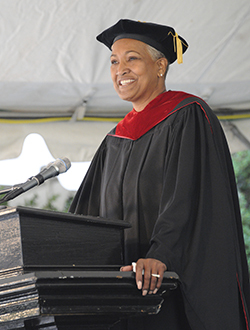 The event was sponsored by the university’s Distinguished Speakers Fund. When she was 23, Goodall’s dream began coming to fruition. She got a job in Nairobi, Kenya, and subsequently met famed anthropologist and paleontologist Louis Leakey. She impressed Leakey with her extensive knowledge of animals in Africa and convinced him she was the person he was seeking to live with and study the chimpanzee in what is now Tanzania. He secured funding to support six months of research, but as Goodall explained, there was another obstacle to overcome. At that time, it was widely thought that only humans made and used tools. Goodall’s observation that chimpanzees were also proficient with tools caught the attention of the National Geographic Society, which offered to continue funding her research. This set the stage for decades of groundbreaking work in studying chimpanzees’ complex social structure, research that earned her worldwide acclaim. 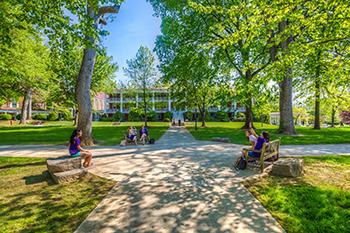 Hollins is one of 42 member colleges and universities of the Council of Independent Colleges (CIC) in the Consortium on Digital Resources for Teaching and Research. Through Shared Shelf, a cloud-based uniform digital platform, members will be able to increase their capacities to store, preserve, and catalog collections of digital images, documents, audio and video files, and other types of materials, while streamlining administrative capabilities. Hollins’ first project will be for University Librarian Luke Vilelle and Professor of Classical Studies Christina Salowey to curate collections of images from her archives. These images include such rarely photographed objects as the Hellenistic painted grave stelai and engraved details from the site of Demetrias-Pagasal. Consortium members will be able to improve teaching and learning and enhance faculty and student/faculty research—on their own campuses and more globally—by making lesser-known or hidden collections searchable and accessible. R.H.W. Dillard, professor of English, was honored by the Fellowship of Southern Writers with the Louis D. Rubin Jr. Award for his service as a literary mentor to students and colleagues. Dillard is the first recipient of the award, presented to him by Jill McCorkle M.A. 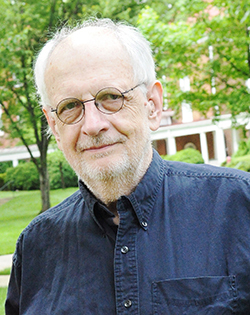 ’81 at the April 2015 Celebration of Southern Literature in Chattanooga, Tennessee. Dillard was on a panel called “Poems and Their Backstories” with Rita Dove, Andrew Hudgins, and Maurice Manning. 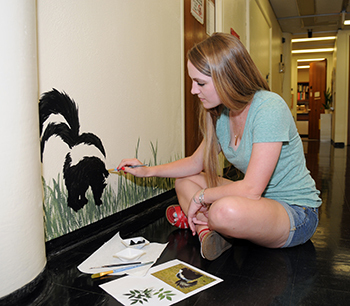 In May, Kristin Bell ’14 painted images of local flora and fauna on the walls of the second-floor wing of Dana that houses environmental studies and biology. An environmental studies major, with a minor in studio art, Bell is entering California State University–Monterey Bay’s graduate program in scientific illustration this fall. 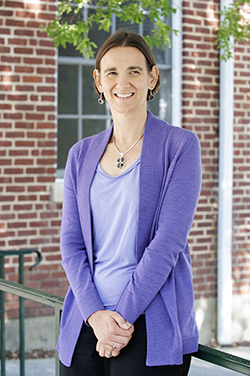 Darla Schumm was promoted last spring to professor of religion. Her current research focuses on intersections between religious studies and disability studies. She has written several articles and coedited three volumes on the topic of religion and disability. Take Hollins’ new online tour and share it with prospective students and on social media: www.hollins.edu/campustour. Spring 2015 magazine cover: Thanks to Mary-Elizabeth Debicki ’57 for her help identifying her classmates who were waving goodbye as they prepared to sail the Atlantic. From top, Joan “Joanie” Heppiner Sharpe, Rosemary “Rosie” Camp Lizars, Martha “Marti” White Wiese, and Mary Stoll Cross.